Bitcasino.io Review - Is this Bitcoin Casino Safe or Scam? BitCasino.io was the first Bitcoin casino to be fully licensed. This was issued in 2013 by the authorities in Curacao, Netherlands Antilles. This casino uses the CoinGaming platform, which features games from leading international software providers like BetSoft and Microgaming. These are accessible via your browser window across many different devices. While the game selection is the same as the other CoinGaming casinos – BitCasino distinguish themselves by having a solid reputation and offering a sportsbook integrated into the site. This review goes through BitCasino in detail. First up, the financial side of things is discussed. This includes the welcome bonus, ongoing offers and making your Bitcoin deposits and withdrawals. Next you will find details on the games on offer at this leading BTC casino. At the end of the page I have summarized what makes this operator stand out, and examined the available trust signals. The initial bonus is a 100% match on your first deposit up to 1 BTC (1000 mBTC). The total amount is smaller than at some other Bitcoin casinos, however the 100% match is larger. There is an additional step of contacting support via live-chat after you deposit to request your bonus. Like at most casinos nowadays, there are weightings for the different casino games in their contribution to clearing your bonus. Slots are at 100%, with table and live games at 10% and the dice / lottery games not contributing at all. There are separate terms and conditions for anyone wanting to clear their bonus using the sportsbook. Only events at even money or better (2.0 +) are considered valid for your wager-through here. I was not able to find any ongoing bonuses, comp point system or special promotions at this casino. The registration is very fast, and does not even include an e-mail verification step to slow things down. Once you are logged in, you will see an orange ‘deposit’ button at the top of the screen. This takes you to a screen with a recipient Id and associated QR code. You simply use your wallet to send the BTC to this address and will see your coins appearing right away. You can withdraw at any time from BitCasino. Go to the deposit screen and switch to the ‘withdrawal’ view on the left hand side under the main menu. You then add your BTC address and the amount in mBTC to withdraw, and the transaction is initiated. Unlike traditional (cash) casinos, there are no restrictions or verification steps for withdrawals here. If you are new to Bitcoin and require instructions and links to get set up, there is a ‘Bitcoin Information’ link at the top right, which contains a detailed FAQ. You will also get an invitation in your ‘welcome’ e-mail to find out about Bitcoin via a live chat operator. The games here can be divided into five categories. There are table games, slots, live-dealer games, dice and lottery. The primary casino games list is made up of titles from Betsoft, an innovative software houses known for their 3D video slot games, and the software giant Microgaming. Table games include the traditional favourites such as Blackjack, Roulette, Craps, Casino Poker variations and Baccarat. All of these load up in your browser, and also offer you a preview of the min / max bets, associated bonuses and the average rating given by other players here. The minimum bets are just 1 mBTC (1 /1000th of a BTC) with the maximum bets at 300 mBTC. You can sort the games via a separate menu on the left hand side. If you are using a mobile device, then choose the games labelled ‘Mini’ which have been optimized for smaller screen sizes. Slots are the main draw here, and if you have not already seen them then the BetSoft titles are the ones to check out. These include titles like Mr. Vegas, 2 Million BC and After Night Falls. These have animated reels, incredible animated bonus rounds and let you win some big prizes. The slots jackpots are not linked between other casinos, though the prizes can still get to over 50000 mBTC. Live dealer casino games are Roulette, Baccarat and Blackjack, bets start at just 1 mBTC, and the games are hosted by attractive dealers. You can chat via a text box with the dealers (who may reply verbally) and other players. 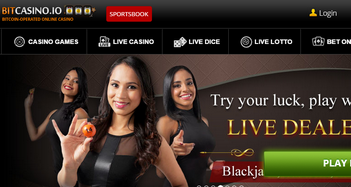 In addition there are separate ‘Dice’ and ‘Lottery’ live dealer games to bet on, again hosted by attractive dealers. This capability is provided by a 3rd party specialist through the CoinGaming platform. 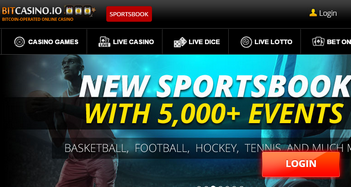 Finally, BitCasino.io has a sportsbook which covers a selection of international sporting events. At this point there are only simple win bets available. This is a very easy to use book, you simply click the event, choose your bet and the number of mBTC to wager, and then click the ‘bet’ button. Right now the number of sports covered is extremely limited though we have been told they plan to expand this section over the coming months. 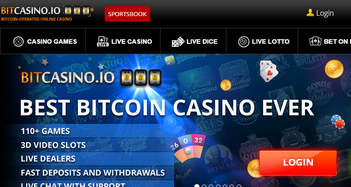 This Bitcoin casino scores highly for trust, with certification and license information linked from their website, and no major scandals reported online. The games here have been audited by Technical Systems Testing, a highly respected 3rd party organization which analyses the Return to Player percentages of slots and fairness of deals. The license is awarded by the authorities in Curacao, who regulate many US friendly casinos. BitCasino are also a Silver Member of the Bitcoin foundation. From the main website of this casino you can reach their sponsored forum at BitCoinTalk, this is one of many communication options. Others include live chat, twitter, Facebook and e-mail. There is no phone number, though the number of the Curacao gaming commission is listed for any complaints. There is one disgruntled player actively posting on the forum thread, though most people in touch with the casino via that medium do not seem to have major issues. All-in-all, BitCasino.io is a highly reputable, legitimate operation. The game selection is excellent, with the slots and the live dealer casino being the most popular. I’d like to see some more generous ongoing bonuses and promotions but for now, there’s no doubting these guys are among the top options for bitcoin casino players.